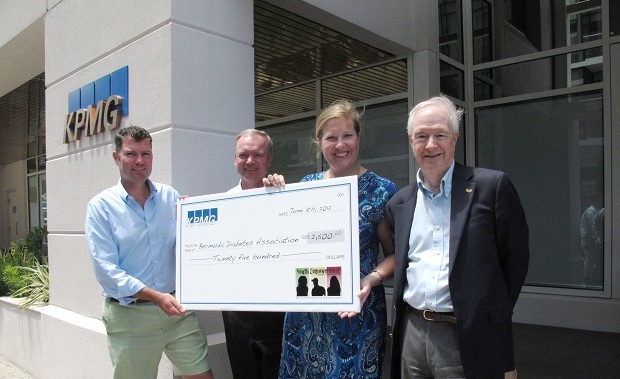 KPMG in Bermuda is pleased to announce its support of the Youth Empowerment Programme, a joint initiative of the Bermuda Diabetes Association [BDA] and the Bermuda Hospitals Board [BHB] Diabetes Centre. This programme has been designed to provide valuable training opportunities for persons interested in working with young people who are affected by Type 1 or Type 2 diabetes and/or are at risk of developing Type 2 diabetes. The purpose of this 3 day workshop is to facilitate the development of innovative programmes to address obesity in Bermuda as well as helping those with Type 1 diabetes manage their condition for long-term health benefits. Managing Partner of KPMG in Bermuda, Neil Patterson, noted, “As part of our continued commitment to the community, KPMG is delighted to underwrite the costs of this important initiative. The work of the Bermuda Diabetes Association and the BHB Diabetes Centre is critical to the wellness of our island and especially our youth. Workshop co-organizer Dr. Annabel Fountain, the BHB’s Director of Endocrinology and deputy chair of Bermuda Diabetes Association added, “This workshop aims to bring together adults who are interested in young people affected by diabetes. Debbie Jones, manager of BHB Diabetes Centre member and director of Bermuda Diabetes Association, says “Under the guidance of the Overseas Workshop Specialists Lorne Abramson and Shelley Yeager. It is our intention to develop programs which will be beneficial for children and their families not only addressing the obesity epidemic in Bermuda but also empowering young people with type 1 and type 2 diabetes. “We are very grateful for KPMG’s leading support of the Youth Empowerment Programme. From this initial event we expect future educational and support programmes to be developed which will benefit Bermuda’s youth and promote wellness throughout the island. We are extremely fortunate that we can offer this programme to you and thanks to KPMG’s support of the Bermuda Diabetes Association it is offered at no cost”. The workshop is being held over three days at Mid Atlantic Wellness Institute [the location of BHB Diabetes Centre], 44 Devon Springs Road, Devonshire from 4 to 8 pm on Wednesday June 20, Thursday June 21 and Friday June 22, 2012. The 3-day programme runs from 4pm to 8pm each day. To learn more about the programme or register for it, please email diabetescentre@bhb.bm or call 239-2027.